Locals in village of Comrie, Perthshire, unveil new book produced by residents about the historic Second World War camp which housed high-profile Nazis. Residents of the Perthshire village of Comrie have produced their own history of an infamous local prisoner of war camp thanks to Lottery funding. During the Second World War, Cultybraggan, near Comrie, held some of the most notorious Nazis - including Hitler’s deputy Rudolf Hess. 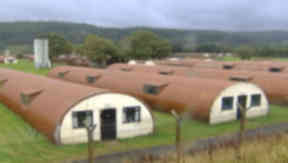 The camp was bought through a community right-to-buy option for £350,000 in 2007, after the Ministry of Defence put the historic site up for sale. It had been feared the land would be seen as a prime site for house-building, causing a massive growth in the picturesque village of 2000 people nearby. The Cultybraggan camp was first set up in 1939 as a maximum security prison and housed up to 4000 German and Italian prisoners of war. Ringleaders of the infamous Devizes plot—to break as many as 250,000 PoWs out of camps across the country in 1944 and attack Britain from within —were sent to Camp 21 at Comrie. The MoD retained the camp to use as a training site after the war but closed it in 2004. Now, a new booklet penned by members of the Cultybraggan local history project has appeared on bookshelves in the area. Camp 21 Cultybraggan: A History is billed as a must-have for anyone who is familiar with the infamous PoW camp. The 56-page booklet describes the camp, tells the story of some who passed through its gates, and charts its many uses since being built during wartime Britain. Financed by a grant from the Heritage Lottery Fund, proceeds from sales of the publication will further the work of the local history group. Chairman Grant Carstairs said: "The group is delighted with the final product and the very positive reaction to its publication. "Our designer and printer - Scott Russell and David Philips - took an enthusiastic interest in the project and turned our efforts into a really professional-looking booklet. "We are really grateful to the Heritage Lottery Fund, to those that contributed information for the booklet, and to the local businesses who have agreed to take copies to sell on behalf of the group. In the past few days alone, Comrie post office has sold nearly 100 copies." Group member Eunice Cartwright added: "Camp 21 took over a year to compile so it has been great to see it finally rolling off the presses. "However, the booklet will not be the last word on the matter...we are still finding out more about the camp with every week that passes, so there is already talk of updating it in the future." The booklet can be bought from the Comrie development trust office and other outlets in Comrie and Crieff.